The economy is usually a pretty popular topic in the news, because is truly touches everybody. With the crises that have hit in the last year or so, the economy has become even more popular than usual. Plenty of people provide advice and opinion about what is going to happen in the future and what the causes are. The current situation demonstrates why it’s important to understand the economy better, not just for now, but in general. There are certain things in this society that should not just be left to the experts, because they affect us and it’s essential for us to understand what our politicians are doing, no matter the political party or the philosophy. The Cato Institute provides analysis that I find helpful. Â Below are two videos with Daniel Mitchell of the Cato Institute in the first discussing Keynesian economics and somewhat how it relates to the current situation and the second from 20/20 discussing the bailout situation. I think it’s important to get differing perspectives on these issues, so these videos are not definitive. I hope they help some of us become more enlightened and give us a desire to better understand what’s going on with our nation and world, economically speaking. I think the first clip is good to watch, even if you don’t agree with everything he says. His explanations are sound and he makes some great points. he one weakness I found was the way he discusses Hoover’s implementation of Keynesian policies. He uses this as an example of Keynesian’s failure as a policy, but Mitchell doesn’t provide enough support to show this to be specifically causal. The years shown are the start of the depression. This example would have been more useful had Mitchell attempted to show that Hoover’s policies led to or exacerbated the impact of the depression. This is still a video that’s worth watching. The second video is from 20/20, also featuring Mitchell, where John Stossel tries to find out where all the bailout money went. 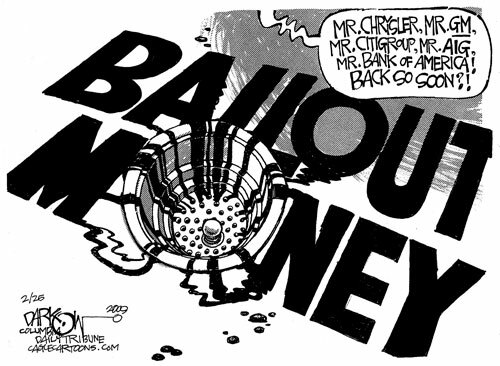 He doesn’t discuss the philosophy behind the bailout as much as governments failure to manage the bailout properly. You rightly mention that many people are looking at the economy stories however, usually people look at stories that interest them this time it’s through fear. Great blog so real interesting stories, keep it up!